Hugh stood as independent parliamentary candidate in the 2010 General Election, a successful contribution to a campaign in Battersea for the decommissioned Bolingbroke Hospital to be converted into a new secondary school. His blogs on this campaign – ‘Why did I do it?’, ‘What was it like?’ and ‘Was it worth it? – are included in a book ‘Ideas for Britain’. For the duration of the next parliament, Hugh blogged on Huffington Post and a marketing website then called BrandRepublic.com. These two books are compilations of these blog posts. 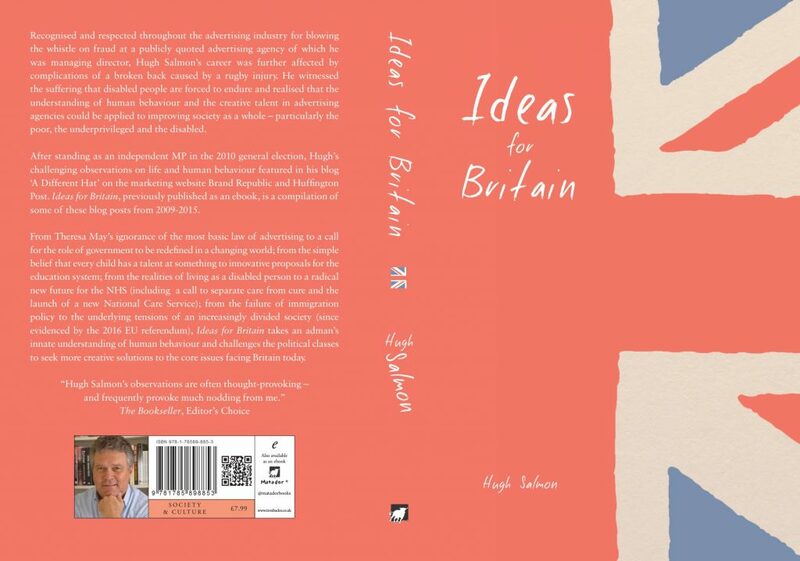 Hugh’s overarching thesis is that the most innovative and effective solutions to the issues facing society today are more likely to come from the consumer-based analysis, market research and strategic thinking skills of UK’s internationally renowned creative industries than career politicians. The wrong people are in the wrong job!